Simon at Palms Place invites guests to experience three courses from the new Market Menu and enjoy a tasting of Chef Kerry Simon’s finest dishes for just $45. The Market Menu changes each Saturday so diners experience new seasonal tastings every week. Rock-n-roll chef Kerry Simon uses his signature style and flair to create an affordable menu that guests can enjoy in the main dining area with floor to ceiling views of the Palms Place pool or pair with cocktails and relax on the comfortable, modern couches in the lounge. Guests can select from a variety of choices for each course and find a suggested wine or sake pairing for all menu items. First course choices include: Roasted Peach and Lipstick Pepper Salad with sopressata, ricotta, kenter canyon farms arugula and lemon chili vinaigrette; Stone Crab Claws with cocktail sauce and whole grain mustard sauce; Five Onion Soup with sweet onions, pretzel bread crouton and baked fontina cheese. Second course choices include: Braised Heritage Pork with parmesan gnocchi and a porcini mushroom broth; Habanero Marinated Wagyu Flat Iron with soy and lime, wok tossed broccolini and jasmine rice. Third course includes: Apple Tart Tartin with crème fraiche ice cream. Simon at Palms Place is open seven days a week from 7:00 a.m. until 11:00 p.m. serving Chef Kerry Simon’s takes on American breakfast, lunch and dinner. With multiple dining room options and a full sushi bar, Simon is a great restaurant for a power breakfast or lunch, or a nice, relaxing dinner. 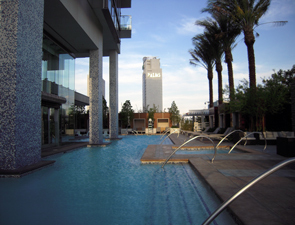 Simon at Palms Place is located at Palms Place Hotel & Spa at Palms Las Vegas, 4381 West Flamingo Road, Las Vegas, NV 89103. One of the wonderful things about living in America is the great number of cuisines available to those of us living in ‘The Great Melting Pot.’ Occasionally, though, traditional flavors have been watered down to suit the mainstream palate but if you can manage to get your teeth into some authentic international dishes, you’re in for quite a treat. Whether dining out or ordering in, these are the Top Five International Cuisines favored by American diners. An old staple for any occasion, whether it be a romantic night on the town, an evening at home with pasta, wine, and a good movie, or a small gathering of friends with a nice, hot pizza, Italian food has been popular with American diners for decades. For an authentic experience, avoid the chain restaurants, head straight to Little Italy and try to find a place that serves Tagliatelle al cinghiale, a dish made with broad noodles and wild boar. You just may find a new favorite in this classic category. The best foods from this country are not necessarily the ‘Americanized’ Chinese dishes that consist of chicken fingers and pork fried rice, but the truly authentic cuisine you can get from restaurants in Chinatown. You know the sort of place, a once brightly colored sign written in a language that resembles graffiti, whole, roasted animals hanging in the front window, and perhaps a feeling of intimidation as you walk by. If you can manage to conquer the fear of the unknown, go in with an adventurous friend and order some liver stir fried with bean sprouts and greens, roasted pig heart, or, if those aren’t your speed, some Peking duck soup. For the people who have avoided this cuisine because they don’t like spicy food, I advise them to go to an Indian restaurant and try the Tandoori Chicken. Flavorful, juicy, pleasing to all the senses, this may be some of the best chicken you’ve ever tasted. If you live near a large city and can take the heat, do a little research on the local Indian restaurants; many offer very affordable lunch buffets with a large sampling of the establishment’s most popular dishes. Diners that suffer from peanut allergies should be incredibly wary of Thai cuisine as this seemingly harmless legume is found crushed and sprinkled on many Thai dishes. The most well known dish, of course, is Pad Thai, an incredibly complex melange of rice noodles, fish sauce, garlic, egg, shrimp and crushed peanuts. There are, of course, a number of other ingredients but these are the headlining flavors on this eclectic stage and they put on an amazing show your taste buds won’t soon forget. The American palate is entering an age of enlightenment as the once-popular homogenized international cuisines are being passed up for more authentic fare. Join the movement and try something new! continuing our 25% discount on all bottles of wine sold through the end of the year. For the full scoop on Veritas read our listing here. 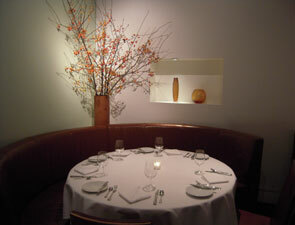 Veritas is located at 43 E. 20th St. NYC, For Reservations call 212-353-3700. Celebrity chef Kerry Simon and beer expert Jon Lundbom. Friska - Crisp white ale made with coriander and orange peel styled after a Belgian Witbier. Nuova Mattina - Italian saison brewed with coriander, ginger, green pepper, chamomile and licorice. Strada San Felice Chestnut Ale - An amber-colored beer bottom-fermented with distinctive flavor and aroma from wood-fire roasted chestnuts. Malthus Baluba - Complex double malt stout fermented with dried apricot, pineapple and ginger. Scires - A refreshingly sweet-tart beer combining sweet dark cherries with a blend of two sour ales, one old and one young. Wednesday, September 30, 2009, 7 p.m. The Herb Room inside Simon Restaurant & Lounge at Palms Place. $75 per person, which includes a five-course dinner and all beer pairings. Space is limited. For reservations, please call (702) 944-3292. Simon Restaurant & Lounge is located inside Palms Place, 4381 West Flamingo Road, Las Vegas, NV 89103. Jon Lundbom’s enthusiasm for all things beer dates back to his college days in Chicago’s fertile world of home brewing and beer appreciation. Many years and several degrees later, Jon began working for Artisanal Premium Cheese in New York and more seriously studying fine food, drink and, of course, cheese. Today Jon teaches beer, wine, spirits and cheese classes all over Manhattan and works for B. United International, one of the nation’s foremost importers of beer, sake, mead and cider, while traveling the world on a never-ending quest to learn more about its newest and most exciting beverages. Vin Bar, the eclectic and more informal dining environment of Valentino Houston, opened September 21 at Hotel Derek, followed by Valentino Houston, the fine dining restaurant on October 1. Innovative dishes served in a small plate or “primi” format and an ever-changing array of assorted cold crudo at the Italian raw bar; kind of like Italian sashimi, will be featured. Vin Bar will be open for breakfast, lunch and dinner, daily and will also offer a unique bar menu with drinks focused on food, like the sophisticated BLT martini. The new Italian restaurant concept, masterminded by James Beard award winners, Piero Selvaggio and Chef Luciano Pellegrini, will offer diners not one, but two exquisite experiences in the dual concept restaurant, stressing that food should be fun, fresh, and flavorful-like a true taste of Italy. The Italian Raw bar will be a welcome addition to the Houston dining scene, featuring more than 17 cheeses and an eye-popping display of Crudo di pesce, a large variety of Salami and Piadine (Italian flat breads) and some typical, regional Italian finger food. Vin Bar menu also offers original pastas, Carpaccio and Tartare as well as dishes like Swordfish “Braciole” with fresh tomatoes, olive and caper salad. And, this is Houston after all, so no menu would be complete without beef-Italian style, of course. Try Executive Chef and Partner Luciano Pellegrini’s favorite baby back ribs cooked slowly in a smoker and basted with an original Tuscan barbecue sauce. Expect stark contrasts in the appearance and the flavors served in Vin Bar and the more elegant Valentino fine dining room. Selvaggio’s philosophy is to present a variety of exciting experiences. “Good food and wine accompanied by spirited conversation - the gracious meal is the continuity in my life,” Selvaggio said. Prepare for a parade of colorful plates. Diners will fall in love with original Italian dishes inspired by the Valentino cookbook; daily specials entrenched in the locale fare; and of course the innovative “primi” menu. Selvaggio and Pellegrini love to create and experiment with food, fusing authentic Italian cooking with the best that local food markets have to offer. Boasting an enormous wine collection, Selvaggio is an ardent wine collector, and diners can count on Valentino for a vast wine list including an extensive variety of Italian and California small producers-hard to get little gems-and a special selection of verticals and rare vintages. Vin Bar opened on September 21, followed by the opening of Valentino Houston, the fine dining restaurant, on October 1. Restaurant patrons can use the West Loop entrance or the main hotel entrance. 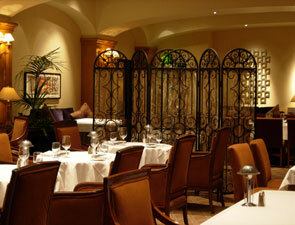 Complimentary valet parking is provided when dining at Vin Bar and Valentino. 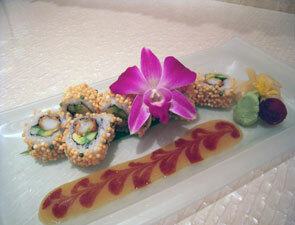 To make reservations or inquire about special events call 713-850-9200; toll-free at 1-877-484-4244. Or visit www.valentinorestaurant.com. Keep up with the Valentino Restaurant Group on Facebook. Watch Eric Ripert in action in his new show “Avec Eric.” If you’re in NYC its channel WNET Sundays at 4:30, if not check out your local station: http://aveceric.com/stationguide. 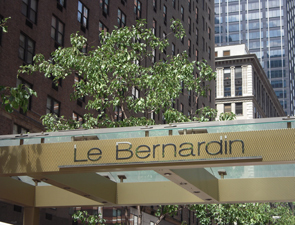 In this second episode, Eric visits Le Bernardin’s “garde manger”- a term that restaurants use that means ‘keeper of the food’ or ‘guard of the food’. This particular station in the kitchen is responsible for the first courses and cold plates - like salads and cold ingredients like smoked salmon or caviar. Because many times these plates are the first taste that a diner eats, it is extremely important that the flavors be at their very best. 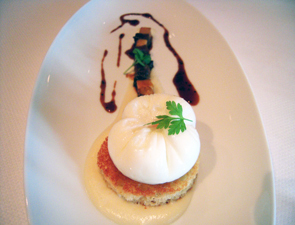 Later, he travels to the west coast to meet David Kinch who is the chef/owner of Manresa in Los Gatos, California. Chef Kinch is so serious about knowing exactly where his ingredients come from that he has purchased his own plot of land and hired an award-winning farmer to grow the vegetables that he uses in his restaurant. Because so many people are gardening at home and because there are farmers markets popping up in towns all over the U.S., Chef Ripert thought that he would show you how to take the inspiration from California and teach you a simple, fresh seared salmon dish with something fresh from the garden - pea-shoots with ginger-soy vinaigrette. If you’re looking for a way to celebrate Mexican Independence Day the traditional, authentic way, I would advise you to avoid Taco Bell and ground beef seasoned with an Old El Paso taco seasoning packet. A far cry from normal Mexican food, let alone Mexican holiday food, these foods do a disservice to a cuisine that is actually fairly simple to make at home without having to resort to premixed packets of seasonings that, frankly, have the ratios all wrong. That topic, however, is for another time. With September 16th upon us, you’ve only got a short amount of time to prepare for your own celebration. You may have seen claims that people make these extravagant seafood dishes like fish or shrimp tacos made with pineapple or mango salsa. First of all, even if this were true, it would only be true for coastal Mexico. Second of all, even in coastal Mexico, the prices of seafood are still higher than those of, say, beef, pork, and chicken so the likelihood of a large, multi-generation household being able to afford enough seafood for twelve or more people is quite low. So far, that rules out seasoned ground beef and seafood. You might be wondering just what the traditional food of choice for celebrating Independence Day is, at this point. Well, the secret is in the sauce, mole sauce, to be specific. Mole is the quintessential special occasion dish of Mexico. It is served on Cinco de Mayo, at weddings, quinceañeras, and is even left as an offering to the dead on Dia de los Muertos. There are about nine different types of mole and limitless variations on them but the most popular and internationally famous type is mole poblano. The most basic version of this recipe has about 24 ingredients, including five varieties of dried chiles, crushed almonds, crushed peanuts, chocolate, and a lengthy list of other spices and herbs. The result is a potent, aromatic, dark brown sauce that isn’t as spicy as you might think but still has enough kick to justify keeping a pitcher of margaritas handy. This rich, complex sauce is served with chicken parts that have been boiled or fried in lard. I can’t speak for every household in Mexico but my family prefers boiling the chicken until it is mostly cooked through and then finishing it by simmering in prepared mole sauce. This process allows the flavors in the sauce to permeate the chicken, resulting in a more pleasant, flavorful experience. 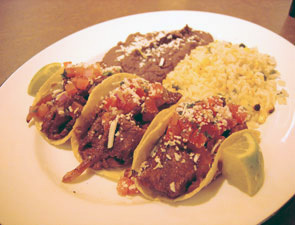 We also serve our mole with rice and fresh, warm tortillas. The process of making mole may seem a bit intimidating but the fact is that the recipe simply involves a lot of simmering and blending of ingredients. However, if you’re still feeling daunted by the task, fear not. There are a number of companies that produce jarred mole concentrate and mole cubes that can be mixed or dissolved in water or chicken stock to make homemade tasting mole poblano. Most notable and easy to find in America is Doña Maria. Even we keep a few jars of it around because in many cases, it’s easier to find than some of the ingredients needed to make mole the old fashioned way. This September 16th, skip the ground beef and taco seasoning and spring for a jar of Doña Maria, a can of chicken stock, and a package of chicken parts. You won’t regret it. ¡Viva la independencia!